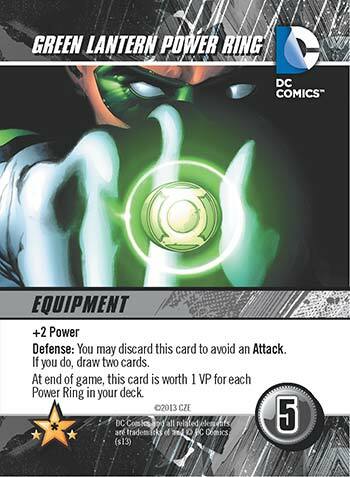 This week, I thought I’d take a look at a superhero-themed card game. 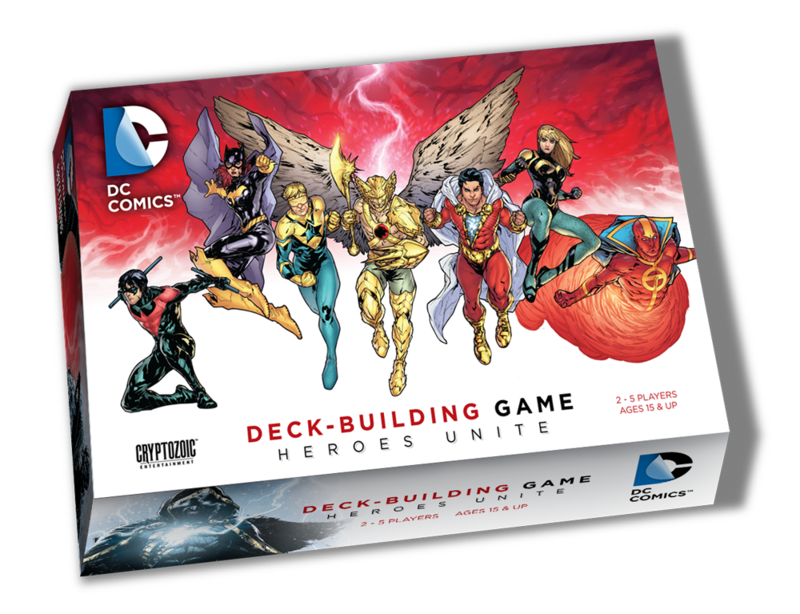 On the table is the ‘DC Comics Deck-Building Game: Heroes Unite’, published by Cryptozoic Entertainment. The standalone/expansion set brings new heroes, tougher villains and more of the fun-filled, fast-paced gameplay. The first thing you’ll notice about the game is that the box isn’t something you’d want to toss in the general vicinity of your friends’ heads, unless of course you really hate your friends. This thing sure has some bulk to it for a card game. (The dimensions are 12 ¼” x 8″ x 3″.) To be fair, the design serves a purpose. Inside is a plastic insert divided into sections so that the cards from a few sets can be added and kept organized all in one place. It also seems to be able to accommodate cards in protective sleeves, although it’s just a hair on the snug side. If you’re unfamiliar with deck-building games, the basic idea is that each player starts out with the same stripped-down deck of cards, putting everyone on a level playing field. On your turn, you play cards from your hand to perform your game text and/or purchase better cards for your deck. When you’ve done everything you want to, any cards remaining in hand are then put into discard piles to join whatever was played/purchased that turn, and then a new hand is drawn. Over the course of the game, this process is repeated and the decks will keep growing stronger and stronger, until finally there’s nothing left to do but count up your scores and determine the overall winner. 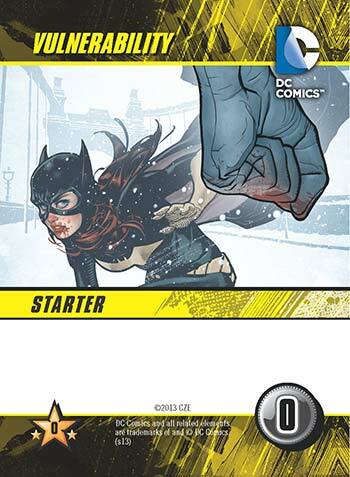 Starter decks in the ‘DC Comics Deck-Building Game’ consist of only two different types of cards: Seven “Punch” cards and three “Vulnerability” cards. Starter cards are easy to find in the box, as they’re yellow and marked with “Starter” on them. Punches provide Power, which is used to purchase/defeat cards in a game, while “Vulnerability” cards really don’t serve any purpose except clog up your hand. It’s also worth mentioning that the number in the gray circle located on the bottom right corner of a card is how much Power is required to buy or beat that particular card. Likewise, the number in the gold star (bottom left) indicates how many Victory Points the card is worth at the end of the game. Along with the starting decks, each player is also assigned one of the oversized Super Hero cards, either at random or by choice. Every Super Hero has a special ability that can aid players throughout the game and may even impact their overall strategy. 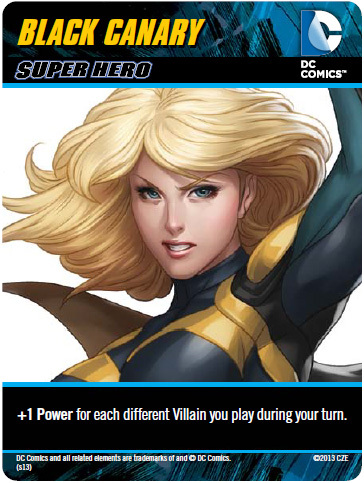 For instance, Black Canary provides +1 Power for each Villain played on a turn, so it’s a good bet that a player will likely want to focus on collecting Villain-type cards to make the most out of this ability. Different Super Hero cards can be found in every expansion, but the seven included in this particular set are: Hawkman, Red Tornado, Nightwing, Black Canary, Batgirl, Booster Gold, and Shazam! The majority of cards that players will purchase in the game come from the Main Deck (111 in total). The Main Deck includes five types of cards: Hero (blue), Equipment (gray), Location (purple), Super Power (orange), and Villain (red). Before the game begins, this deck is shuffled and five cards are flipped face-up and spread out to form the “Line-Up.” Players may purchase any number of cards from the Line-Up during their turn if they have enough Power to do so. When they’re finished their turn, the Line-Up is replenished back up to five cards (if possible) for the next player. In addition to the main deck, there are three different sub-decks in play called the “Stacks,” the first of which is the “Kick” stack. This stack is made up of all 16 Kick cards. Basically, Kicks can be bought when a player doesn’t like or can’t afford anything in the Line-Up. Kicks are stronger than Punches (providing +2 Power instead of +1) and they’re also worth 1 Victory Point, so getting one of these is usually better than nothing. The “Weakness” stack is comprised of the 20 Weakness cards. Rather than being purchased by players, Weakness cards are only acquired through certain game effects. 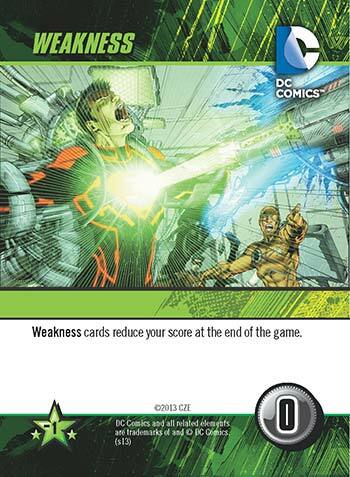 Weakness cards are essentially the kryptonite for players (they’re even green) as they take up valuable deck space and reduce Victory Point totals at the end of the game. The third and final stack is the most fearsome: the “Super-Villain” stack. While there are 12 Super-Villain cards included in the box, only eight of them are used during a game. Seven of the Super-Villains are randomized and placed face-down, while each standalone game has a specific Super-Villain that always begins the game face-up on the top of this stack. (In ‘Heroes Unite’, this character is Vandal Savage.) Defeating Super-Villains works pretty much exactly the same as purchasing cards. If one is removed from the stack, the next one moves in to replace it at the end of the turn. Their only difference is they have a “First Appearance: Attack” ability that does nasty stuff to you when the card is flipped over. 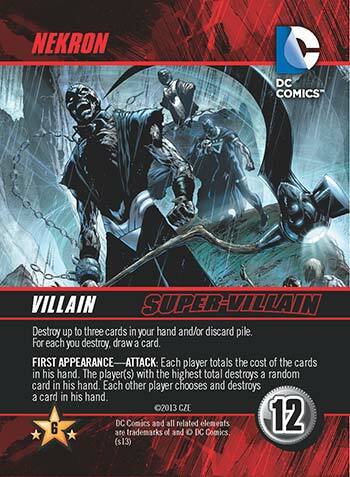 For example, Nekron is particularly brutal as he destroys cards so they can’t be used anymore that game. Super-Villains are very enticing as they are not only worth a lot of Victory Points, but they can also boost a deck’s overall effectiveness with their powerful abilities. The end of the game is triggered when one of two conditions are met. If either all five slots in the Line-Up cannot be filled or there are no more Super-Villains left to flip over at the end of the turn, the game is immediately over and players calculate the Victory Points in their decks to determine who wins. The player who has the most Super-Villains will break a tie. I’ve played five or six different deck-building games and this one is by far my favorite. Sure, it’s not incredibly deep, but for me that’s one of the game’s biggest strengths. It’s great for casual and new players alike. It’s very easy to teach and the mechanics can be learned in a matter of minutes. Set-up time is a breeze as well, since all you really have to do is make a few different piles of cards and you’re off to the races. The color-coded cards also make sorting afterwards quick and painless, so you can set it all up and go at it again. And trust me, this game is so much fun you’ll want to play it again. It’s also pretty amazing how such a simple game can have so many strategic options. Do you go for that Super-Villain to get the juicy points? Do you buy a card so you can benefit from its ability? Or do you purchase something just because you know someone else wants it more than you do? There are quite a few ways to screw with people, and if you’re really lucky you could even pull off a Hail Mary win if you manage to set up one of the ridiculously powerful card combos that exist here. You’ll be surprised how many tough decisions you’ll face in this game. 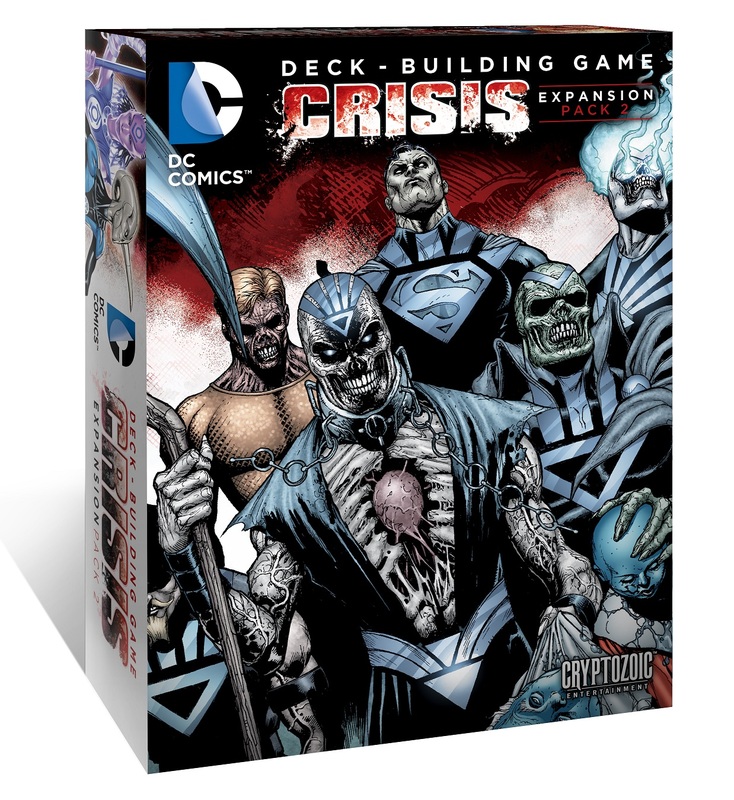 The only real downside to the ‘DC Deck-Building Game’ is that despite the gorgeous artwork on the cards, and despite the property it’s based on (I’m a huge DC fan), the theme ends up being a bit weird at times. Why a villain would keep coming around to help a hero is beyond me, but hey, I can live with it. The good news is that this is addressed in the ‘Crisis’ expansions – one of which is due to be released shortly and will be the subject of our next game review. ‘Heroes Unite’ contains everything required for 2-5 players and includes: 211 game cards, 7 oversized Super Hero cards, and a rulebook. The MSRP is $40.